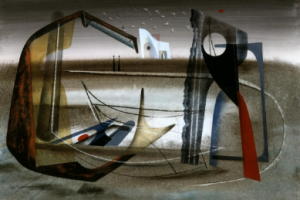 This is a surrealist painting by John Tunnard, who embraced British surrealism and was influenced by Herbert Read’s book, “Surrealism.” Read also wrote poetry. WWII had been underway for nearly five years when this painting was created, and its dark atmosphere is reminiscent of the dissenting response from artists and writers. “We’ll Meet Again,” sung by Vara Lynn, is one of the most well known songs of WWII and represents the sentiment of those whose loved ones were sent to the battlefield. disdained the level glittering plain.